With the Suzuki Boulevard C50T you’ll find yourself equally at home on the boulevard or the interstate. 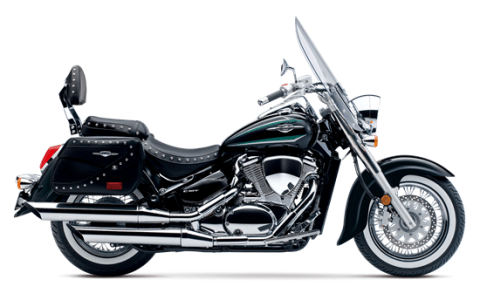 Its fuel-injected, 50 cubic inch V-twin engine delivers abundant torque and is engineered for comfort. Its bold styling stands out in a crowd, while a long list of features make it ideal for comfortable long-distance cruising. Features include a spacious riding position, aerodynamic windshield, custom-made leather-look saddlebags, and a backrest designed for passenger comfort. 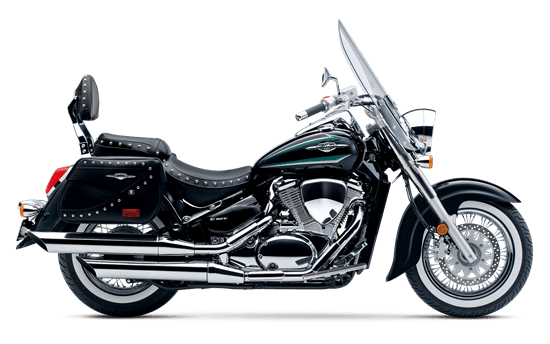 Link-type rear suspension is shaped to mimic the hard-tail lines of a traditional cruiser, connecting a truss-style swing arm and a single shock absorber with 7-way spring preload adjustability providing 4.1 in. of smooth and response suspension travel. A kicked-out, 33° rake and long 65.2 in. wheelbase provides a smooth, comfortable ride. Stout telescopic front forks deliver generous 5.5 in. of smooth wheel travel. A beefy 15 in. rear tire and matching 16 in. front tire have wide white side-walls and are mounted to bright, spoke-style wheels for a nostalgic cruiser look. Narrow 805cc, fuel injected, liquid-cooled, SOHC, four-valve-per-cylinder, 45 ° V-twin engine is tuned for exceptional low RPM torque. A wide-ratio 5-speed transmission features a high 5th gear ratio for relaxed highway cruising. Low-maintenance shaft drive is clean-running and has minimal torque reaction as it efficiently transmits power to the wide 15 in. rear tire.